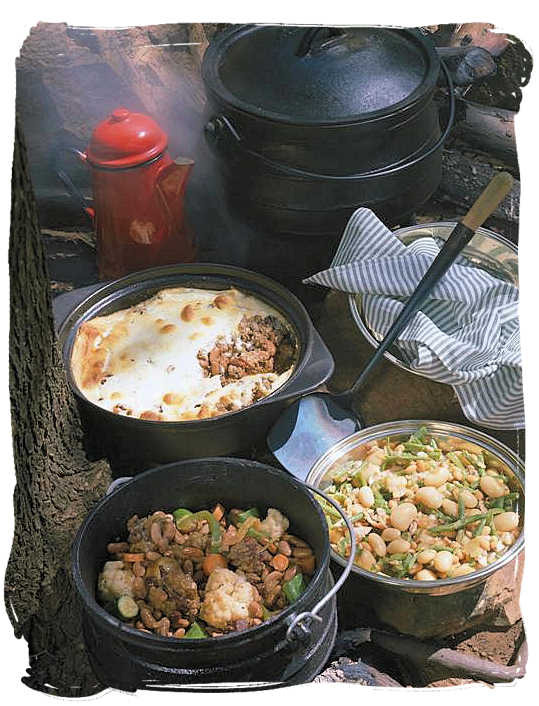 "Potjiekos" (literally meaning pot food) has been part of South Africa’s culture for many centuries. 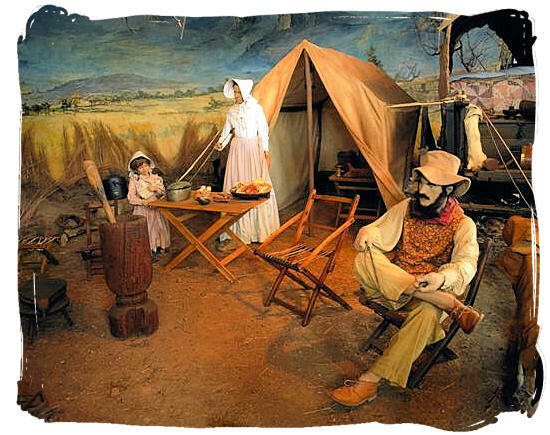 When the first Dutch settlers arrived in the Cape, they brought with them their ways of cooking food in heavy cast iron pots, which hung from the kitchen hearth above the fire. 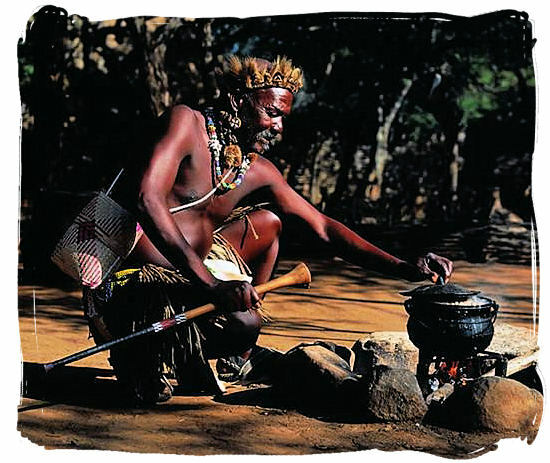 Long before the arrival of the early settlers in the Cape, the Bantu people who were migrating into SouthAfrica, learned the use of the cast iron cooking pot from Arab traders and later the Portuguese colonists. These cast iron pots were able to retain heat well and only a few coals were needed to keep the food simmering for hours. They were used to cook tender roasts and stews, allowing steam to circulate inside instead of escaping through the lid. The ingredients were relatively simple, a fatty piece of meat, a fewpotatoes and some vegetables were all that was needed to cook a delightful meal. 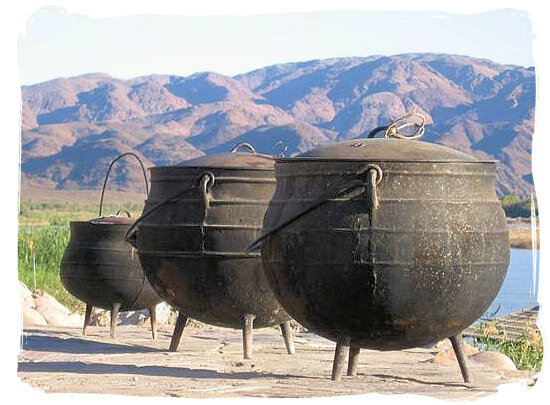 The round potbellied cast iron pot was the perfect cooking utensil to suit the nomadic lifestyle of the black tribes and the Voortrekkers during the 17th and 18th centuries. 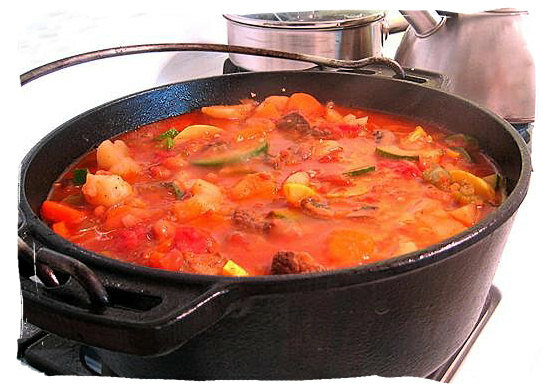 "Potjiekos" evolved as a stew, made ofvenison and vegetables (if the latter were available). The pot with its contents protected by a layer of fat was hooked under the wagon by the Voortrekkers while travelling and unhooked at the next stop to be put on the fire again. When the wagons stopped at the end of the day and camp was made, game was stewed and sometimes mutton , goat or old oxen when available. As each new animal was shot, it was slaughtered and the meat added to the pot, together with whatever vegetables that could be found. The large bones were added replacing the old ones, to thicken the stew. Surplus meat was preserved by seasoning and drying. 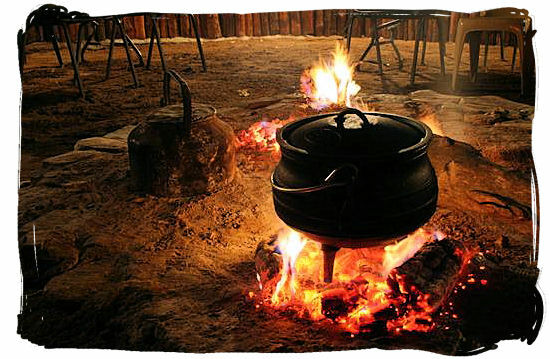 Today, cooking up a "potjie" has evolved into a unique South African social happening, a tradition almost as popular as the legendary "Braai" (barbecue). Family and friends are invited and they all settle around the fire with the softly bubbling "Potjie", chatting, enjoying a drink and having a great time, while the aroma escaping from the "potjie", does its work. The range of different recipes is as wide as the imagination stretches and every "potjie" expert has his or her own secrets and special recipes. The best meat to use for "potjiekos" is what is known as stewing beef, sinewy and gelatinous cuts of beef which become deliciously tender when simmered for a long time, developing a strong meaty flavour. 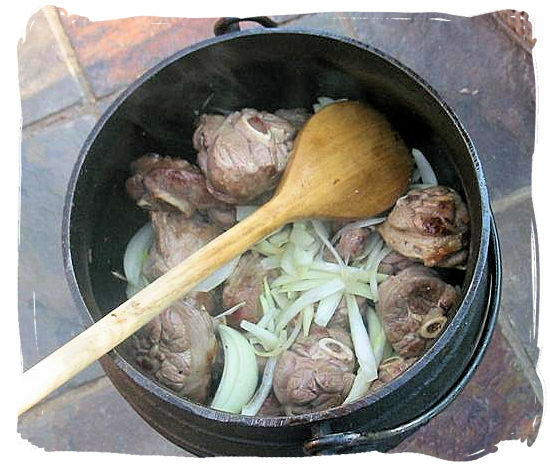 Other meat such as venison, mutton, chicken and even fish make ideal "potjies". The fire is an important part of creating a culinary "potjie" masterpiece. Unlike a "braai", the choice of wood or charcoal does not make much difference, as long as you can regulate the heat. 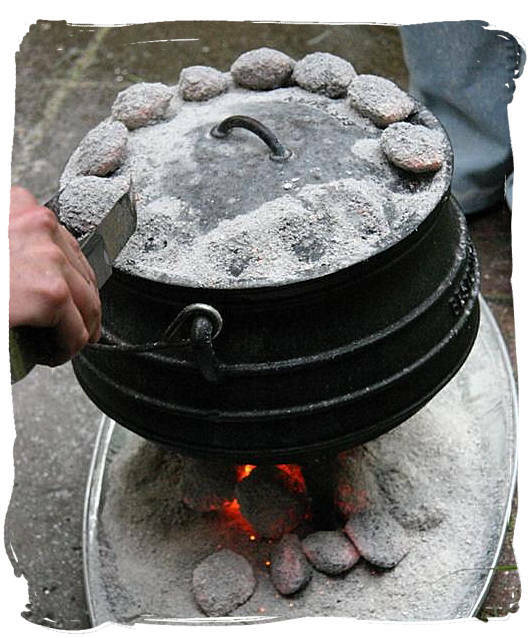 That is done by adding or removing coals once the "potjie" is heated up. You only need a few to keep the "potjie" simmering. A good idea is to keep a separate fire going to provide the necessary coals. Keep in mind to season or "cook-in" a new "potjie" to get rid of any iron filings and other unwanted residue. The packing of the food in layers is the other important part. The meat usually comes first. Add a dash of cooking oil or some fat in the pot, add meat the meat and brown thoroughly. This is essential to seal-in the flavour and improve the appearance of the meat. Cook the meat till nearly done. Add onions, garlic, herbs and spices and sauté. Finally add a little red wine or some meat stock, only a small amount of liquid is needed and stir. Most important, do not stir again until the food is ready to be served. The meat is usually the first layer in the "potjie"
Now pack in the layers of vegetables in order of their cooking times, like carrots and potatoes first and thereafter sweet potatoes, pumpkin, mushrooms etc. Add liquid until about 2 cm under the top layer of vegetables and just leave it for a couple of hours until ready. Add a little liquid when the food tends to cook dry, but only a little at a time as watery "potjie" is not nice and too much flavour is lost. When ready, stir once to ensure an even mix of meat and vegetables, dish up and enjoy a memorable meal. After the meal, rinse the pot with warm water only and then just rub it dry. In the process the residue of fat from the meal will coat the inside and protect it from rusting. If necessary, use a little oil or fat. With time and usage the "potjie" will become smooth and shiny on the inside, a companion for life.